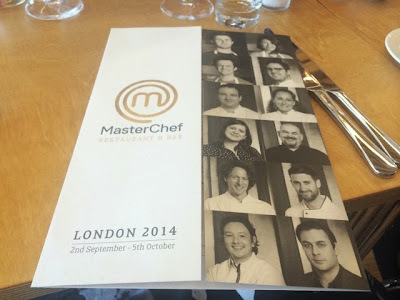 I’ve always been a huge Masterchef fan and when I found out they were putting on a pop-up restaurant in London I knew I just had to go. I then found out it was going to be for the entire month of September which happily coincided with my sister’s 30th birthday and so booked the whole family in for lunch so we could make a day of it. The venue was the Blue Fin building in Southwark which has some fantastic views over the city that can all be viewed from the dining room and the terrace on the floor below. 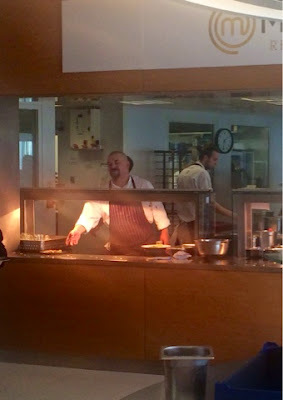 Each week three chefs, who have all been Masterchef champions or finalists, take the helm and we were lucky enough to have Mat Follas, Natalie Coleman and James Nathan cooking our lunch last Thursday. 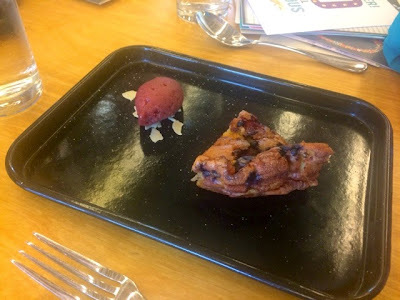 There were two options for each course and the menu stated which chef had cooked each dish. 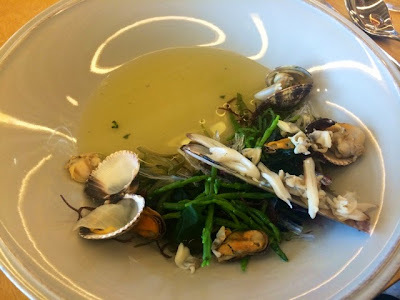 To begin with I chose Mat’s ‘Rock Pool’ which was a dish of shell fish and edible seaweeds with a shell fish consommé. The consommé came in a little side jug which the waiting staff poured into the dish in front of you. There was a great selection of seafood including clams, mussels and razor clams, however for me the highlight was, controversially, the seaweed. I was really impressed and intrigued by the variety of textures and flavours of an ingredient I’m really not all that familiar with. A really great touch was the viewing windows through to the kitchen. 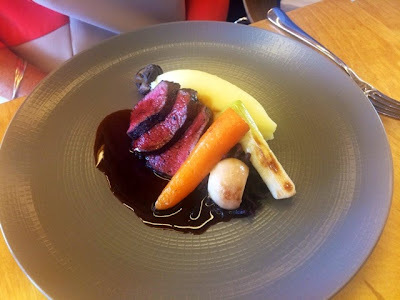 Far from the norm at this standard of restaurant, guests were actively encouraged to go and see the chefs at work and take photos and share their experiences on social media. It was really quite exciting to see all the hustle and bustle going on at the pass and really made you feel part of the action. Let’s face it that’s the bit we all love the most when we watch Masterchef, watching the contestants be thrown into a real restaurant working environment and coping with the pressures of serving lunch to a packed out dining room. 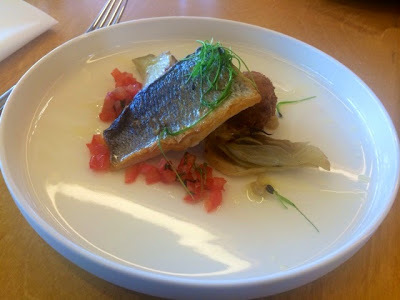 For my main course I went with Natalie’s dish of pan-fried sea bass with fennel, a crab bon bon and sauce vierge. 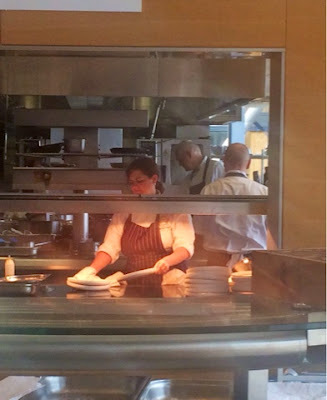 I was up at the viewing window between my starter and main course and so got to actually see Natalie plating up my lunch which was great. It was a really nice firm piece of fish which was obviously cooked to perfection with a nice crispy skin which was packed with flavour. It’s always such a shame when the skin isn’t cooked properly, because a really nice crispy piece of skin can hold so much flavour its a real waste when it’s still slippery and inedible. Two large chunks of fennel at first seemed as if it might be a little over kill, but it wasn’t over powering and the flavour was nicely balanced by the other ingredients. The crab bon bon was a real delight which went perfectly with the sauce vierge. Onto desserts I had to go for Natalie’s ‘Textures of Pear’ as it was one of her winning dishes in the final, although, as she said herself, she has tweaked it a bit since. 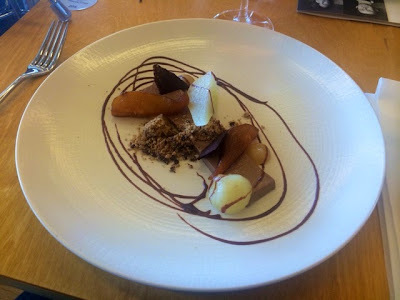 I’m not usually a dessert person, I normally prefer the savoury dishes but I think this was my stand out dish of the day. 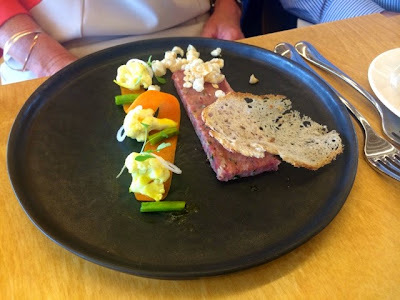 With so many different things happening on the plate its really impressive what can be done with one simple ingredient. With poached pieces, mousses, crumbles and purees, it’s really amazing how much work must have gone into creating this really exciting dish. 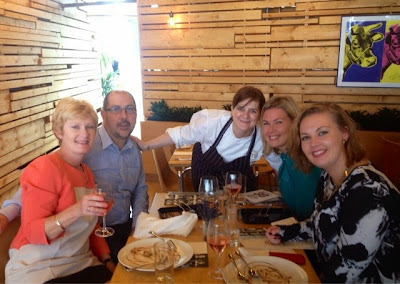 When they’d finished their bit in the kitchen the chef’s came out into the dining room to talk to the guests and take pictures which was a really lovely touch as we had the opportunity to ask them about the dishes and what they’re currently working on. 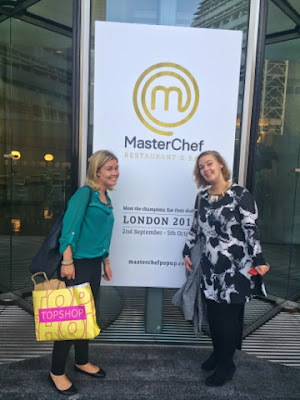 After dinner we ventured out onto the Masterchef bar terrace as it was such a lovely day and the views of the city were really and truly spectacular, we also managed to get a glimpse of the kitchen garden, which you couldn’t go into but you could still get a good look. It was a really lovely end to a really lovely lunch. I hope they do more of these pop-up events in the future as I’d jump at the chance to do it all over again.